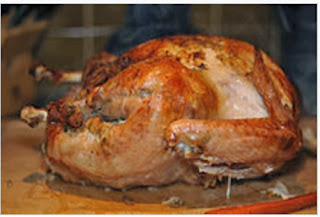 This has been posted annually with minor revisions since the first 2012 Thanksgiving post! I guess this time of year, I'm just too lazy to create a new one. :) Enjoy and have a Happy Thanksgiving. "My cooking is so bad my kids thought Thanksgiving was to commemorate Pearl Harbor." Happy 397th Thanksgiving Day America! Thanksgiving, referred to by many Americans as "First Thanksgiving" was originally celebrated by the Pilgrims and Colonists after their first harvest in the New World in the year 1621 when they invited the Wamponaog Indians to their autumn harvest feast. 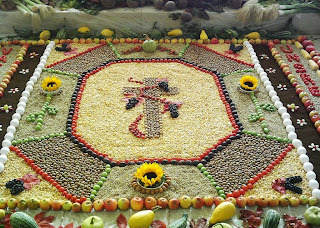 Photo above right of a food decoration for Erntedankfest, a Christian Thanksgiving harvest festival celebrated in Germany courtesy of Wikimedia.org. 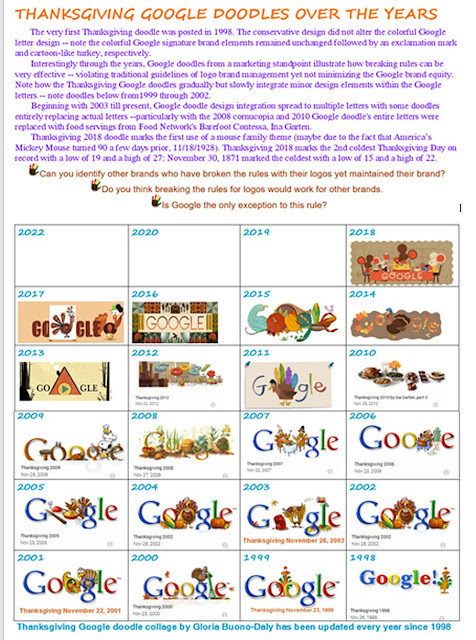 AllThingsDigitalMarketing blog would not stand to it's allthingsdigitalmarketing motif without a collage of "Thanksgiving Google Doodles" past and analysis of Google's basic design structure over the years. Besides the Google logo differentiating itself from the other search engines (e.g., Yahoo, Lycos, HotBot, etc.) 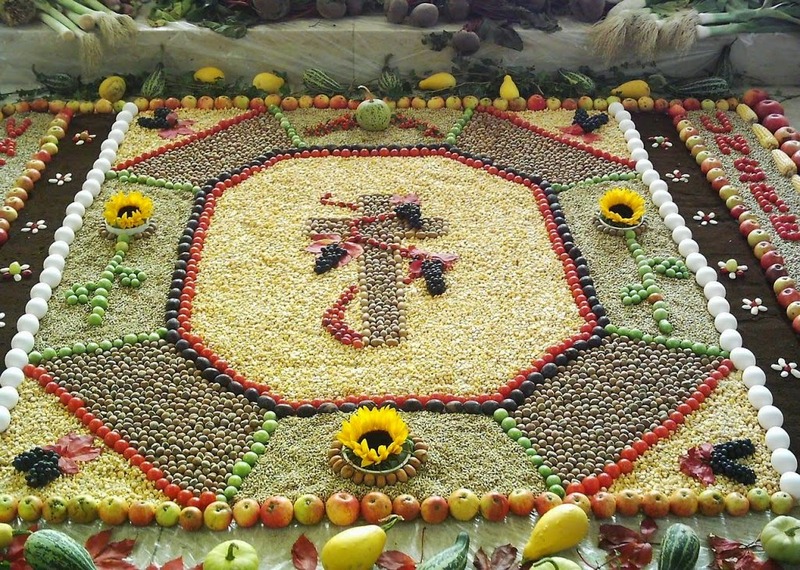 it symbolizes uniqueness and mold-breaking vision. Below are Google's Thanksgiving doodles from the very first doodle in 1998 through present. (This collage will be updated with the most current Google doodle asap, so bookmark and visit frequently). Interesting to see what Google will do this year. • Stay away from simple, elementary fonts (The original choice was the world's most popular typeface -- "Times Roman;" However Google's simple, chisel-style "Catull" typeface was selected for the subtle, sophisticated sans-serif design which incorporated old world writing style (e.g.,chisel and quill) with new age digital. Google signature brand elements remained unchanged for the first Thanksgiving doodle (1998) with the exception of an exclamation mark and cartoon-like turkey, respectively at the very end of the word Google. From a market branding perspective, Google doodles illustrate how breaking rules can be very effective -- violating traditional guidelines of logo brand management yet not minimizing Google brand equity. Interestingly, Google's Thanksgiving doodles gradually integrate design motifs within the Google letters (e.g., doodles from 1999 through 2002). Beginning with 2003 to the present, Google doodle design integration spread to multiple letters with some doodles entirely replacing actual letters -- particularly with the 2008 cornucopia and in 2010 Google doodle's entire letters were replaced with food servings from the design by Food Network's Barefoot Contessa, Ina Garten. Can you think of other brands who have broken the rules with their logos and still maintained their brand? Do you think breaking the rules for logos would work for other brands. Thanksgiving is celebrated on the fourth Thursday of November in the United States and on the second Monday of October in Canada. Although Thanksgiving is celebrated by many in religion and cultural traditions, it is also a world-wide (non-religious) celebration. Photo right miniature pumpkins by Gloria Buono-Daly (taken at Stew Leonards, Yonkers, NY, October 2013). Our 16th President of the U.S.A., Abraham Lincoln, declared Thanksgiving Day a national holiday to be held annually in November during the Civil War (1863). 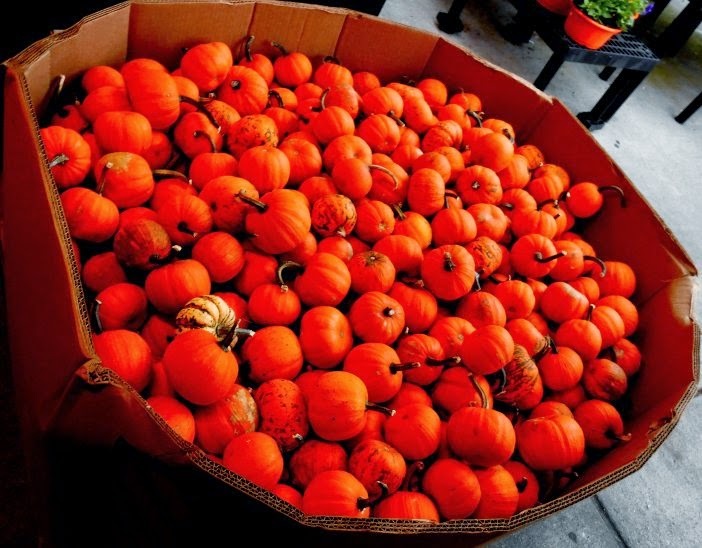 Although New York became the first of several states to officially adopt an annual Thanksgiving holiday in 1817. Not surprising, many Native Americans as well as other individuals disagree with the way Thanksgiving is mentioned historically particularly in text books, school classrooms and other periodicals. They believe millions of deaths resulted from the long and bloody war between Native Americans and European settlers and call Thanksgiving a "day of mourning." 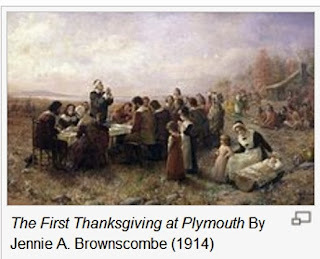 A History.com posting, reports that since 1970, protesters have gathered on Thanksgiving Day at the top of Cole’s Hill, which overlooks Plymouth Rock, to commemorate a “National Day of Mourning.” Similar events are held in other parts of the country. 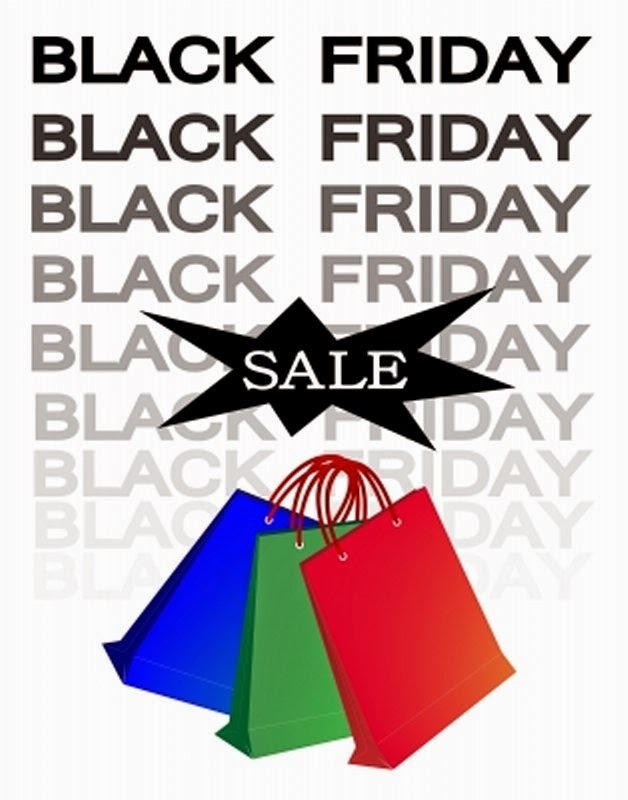 Photo below left of Black Friday sale courtesy of FreeDigitalPhotos. This Thanksgiving for sure many will eat, drink, and sleep while others will shop till they drop for many things especially electronics, smart phones and iPhones. Samsung usually advertises their new products and for sure many will consider the latest Samsung Notebook 4 (released in mid October). So be on the lookout for discounts if you are interested. Not surprising, iPhones will not have discounts. Phone companies offer no-finance monthly plans with a slight discount if you lock yourself into a 2 year plan. Since many are not opting for cell phone lock-ins, you may find great deals for comparative, non-Apple products.What will you be doing this Thanksgiving Day? This year, there are many performers including Mariah Carey, Pat Benatar and Neil Giraldo, and Trey Songz. Click here to view the complete line-up for this year. 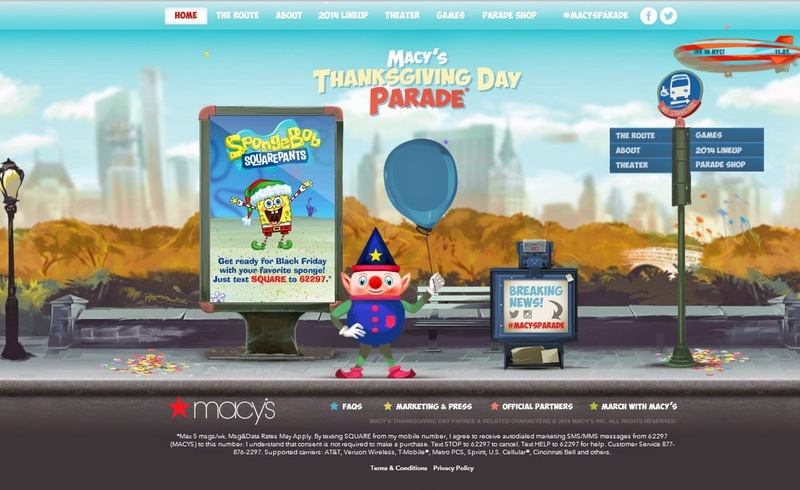 There are plenty of things to do on Thanksgiving -- see links below in the "Resources" section. Thanksgiving Day (Jour de l'Action de grâce in Canadian French) is a national holiday celebrated primarily in the United States and Canada as a day of giving thanks for the blessing of the harvest and of the preceding year. Several other places around the world observe similar celebrations. Please remember to check out the links in the resource section above and share this on your LinkedIn, Facebook, Twitter, and other social media networks you enjoy! Thanks! 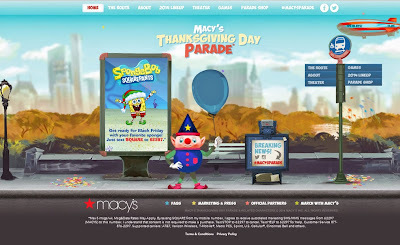 This Thanksgiving post is a reposting of previous AllThingsDigitalMarketing annual Thanksgiving blog posts.